32-bit ActiveX component for Visual Basic and other ActiveX compatible environments (Visual C++, Delphi, Microsoft Office and many more). Fully supports the .NET environment. Easy and comprehensive and yet powerful object model - no matter what experience you have in charting you will literally be able to create complex charts in hours. 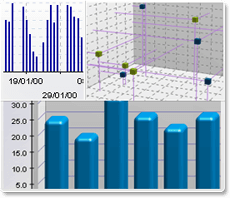 With 87 objects containing 557 properties and 442 methods 3DChart is definitely the most powerful charting tool available on the market. State of the art Microsoft - like visual interface available at runtime. Flexible integrated legend able of displaying almost any descriptive information you want. Annotations can be positioned on arbitrary positions enabling you to increase the readability of the created images. Advanced control over the axis scaling and position - there is no scale mode that we do not support and the axes can be displayed at any position you may think of. Supports Windows XP look and feel. Supports Unicode and Localization to different languages. Seamless ASP and ASP.NET integration. You can create a dynamic client side by just visually editing the component. Configuring the chart to work on ASP and ASP.NET servers is done with a helper application - no code is required to manage your temporary native state, active content or image files. Inserting the chart in the ASP or ASP.NET page is done with one function call. 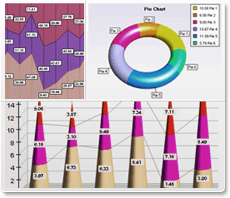 3DChart is user agent sensitive and can generate different responses to different browsers. Increased security features. Direct connection to any ADO data source. The ADO database integration is so flexible that you can even extract the tooltips and the text alignment of the individual data points. Advanced control over the OpenGL rendering engine. You can create a grayscale, jittered or antialized images with just one click. 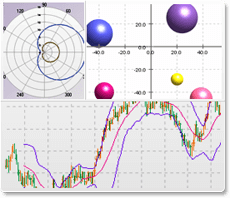 Export to JPEG, PNG, Bitmap, Targa, Tiff or native Chart format. The component can also export PNG, Tiff and Targa images with transparent background. The chart data can be exported to HTML, XML and tab delimited text files. Support for SVG and HTML image maps. Ability to generate WML output for WAP devices. Monochrome bitmap support. The component fully uses the Nevron LLC 3D ActiveX standard. There is not a single surface on which you cannot assign an Animated Texture and material including texts! Some of the visual effects that you can generate with the standard Nevron objects are not even present in professional 3D modeling studio applications. Unique export to code feature. The component can generate the code necessary to replicate the current component state in one of the following programming languages: Visual Basic, VBScript, JScript, C++ and C#.